This special journey takes us further south than at any other time in the season. By flying to King George Island in Antarctica at the start of the voyage, we save two days on the ocean crossing. The time we save by flying south, allows for a more substantial exploration below the Antarctic Circle. Here we witness stunning landscapes, sizable Adelie penguin rookeries and large flat-topped tabular icebergs that drift north from the Bellingshausen Sea. We always anticipate exciting ice navigation when we push this far south. We navigate the glaciated coastline of the Antarctic Peninsula, passing through the Argentine Fish and Yalour Island archipelagos on our way to the Gerlache Strait region. There are several important scientific stations here and a number of significant historic sites we hope to explore. We then aim to cross 66 degrees, 33 minutes south latitude, which officially marks the position of the Antarctic Circle on the global map. With favourable weather and ice conditions we hope to reach Marguerite Bay. This is a spectacular location reached by just a handful of ships each season. Our journey commences this morning in the southern Chilean port city of Punta Arenas. We gather at a central location and transfer to the airport for the two-hour flight across the Drake Passage to Antarctica (this flight is included in the price of your voyage). Upon arrival at the King George Island, we embark our ship via Zodiac. After settling in to our cabins and exploring our new surroundings, we meet our expedition team and fellow passengers. Excitement is in the air as we enjoy a welcome cocktail and our first meal. No doubt, everyone on board will be looking forward to the incredible adventure ahead. Having crossed the broad expanse of the Bransfield Strait overnight, we wake to see the towering peaks of the Antarctic continent for the very first time. This is a deeply moving experience for many on board. We push southwards, navigating to our ultimate objective below the Antarctic Circle. There is much to see and experience on our way south. 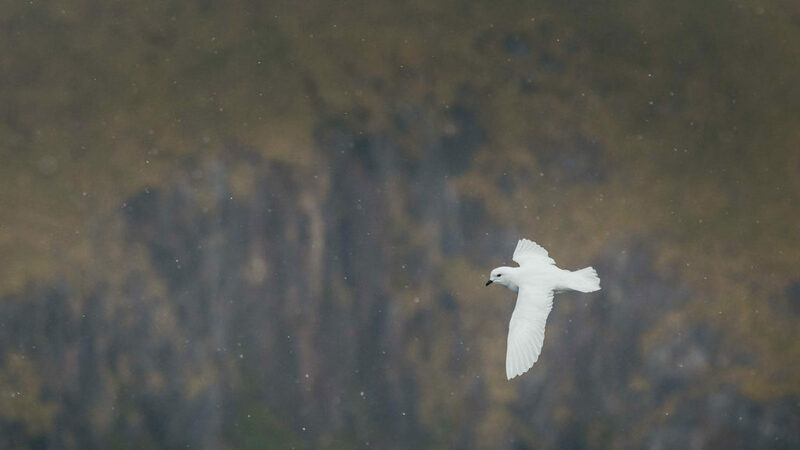 We will be opportunistic, making shore landings in locations that provide great wildlife encounters, or the chance to stretch our legs on a short or long hike, such as Port Charcot. 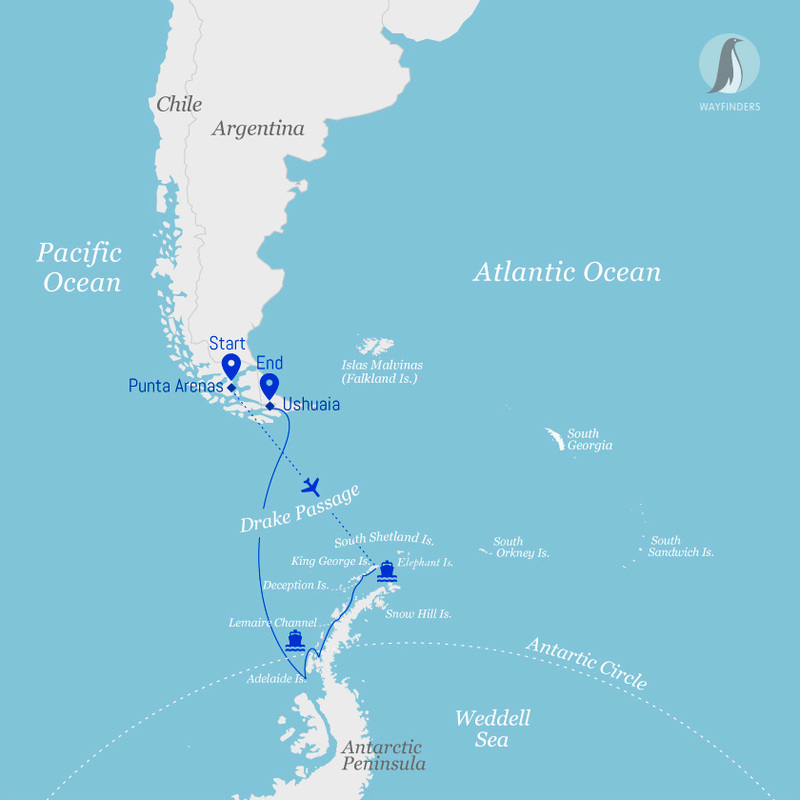 There are several locations in the Fish and Argentine Island archipelagos, which allow for Zodiac cruising and potential shore landings. We hope to visit a working scientific base (Vernadsky Station), to learn of the important climate-related research, which is ongoing. A hike over the snowy saddle of nearby Winter Island allows us to hike and explore the old British Antarctic Survey hut – Wordie House – situated on the site of Rymill’s BGLE Northern Base from the 1930’s. Petermann Island is home to a substantial Adelie penguin rookery. The view to the north, of Mount Shackleton and Mount Scott is impressive. These towering granite sentinels mark the southern entrance to the Lemaire Channel. Nearby Pleneau Island offers more opportunities for shore landings. Just off shore, in the shallow waters of the Penola Strait, massive icebergs run aground. Constant wind and wave action sculpt these gargantuan chunks of ice into fantastic shapes, revealing more shades of blue than you could ever imagine. For many, a Zodiac cruise here will be a highlight of the voyage. It is somewhere in this vicinity we hope to spend a night ashore camping for those interested, if weather conditions permit. We have all the gear and an expert team of guides to make this unique experience happen. There is no need to pre-book – you can decide on the day. This activity is included in the price of your voyage. We are at the mercy of prevailing ice conditions navigating even further south. Years of experience tell us that late February gives us our best chance of reaching Marguerite Bay. We may take the ‘shortcut’, through a narrow channel known as ‘the Gullet’ if the passage is ice-free. Otherwise, we could navigate around the outside of Adelaide Island – which will take more time, yet bring us to the same destination. Marguerite Bay is home to several important science bases – Rothera (UK), San Martin (Argentina), Carvajal (Chile) and features rich history. We hope to make a visit to at least one of these locations. The British Graham Land Expedition (BGLE) of the early 1930’s – led by intrepid Australian, John Rymill, established their Southern Base in this area. They explored and surveyed large areas of the Antarctic Peninsula by airplane, establishing the Antarctic Peninsula was indeed connected to the continental landmass – and not just a series of off-shore islands as earlier believed.